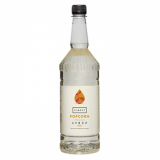 Large 1 litre plastic bottle of Monin popcorn syrup. 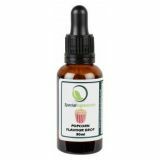 This popcorn flavour syrup has the taste of the famous snack enjoyed and eaten in the movie theatres and is usually served salted, sweetened, buttered or caramelised. When the corn is heated, pressure builds within the kernel and popcorn is ready to be enjoyed once you hear a small explosion that sounds like a 'pop'! Taste: Nose intense buttery popcorn.